Tensors or pendulums enable us to get a positive or negative answer to a precise question from an area of our own perception of which we are either unconscious or inadequately conscious. At the same time, this deals with making our own perceptions visible. Tensors or pendulums can therefore just show what we ourselves sense on the unconscious level. When we ask questions in the appropriate manner, we become capable of making visible our unconscious perception through a muscle reaction. We then receive a reaction from the tensor or pendulum. Grasp the handle of the tensor with your hand. Be sure that you are not tense while doing so. If you use a tensor with a ring as a weight at the tip, the ring should be oriented in an approximately horizontal manner. There is a limited number of possible tensor reactions (movements). So it is important to assign a clear meaning to the individual reactions of the tensor. This assignment occurs when we mentally decide what these reactions are to mean. In general, you should determine the reaction for YES and NO. But we recommend that you also determine a further reaction for NO ANSWER. In addition, we recommend assigning the up and down movement (vertical) of the pendulum to the answer YESand the movement to the left and the right (horizontal) to the answer NO. If other reactions for YES and NO, as well as NO ANSWER, have proved to be effective for you, then stick with them. Dowsing is an old tradition and best known as a method to locate underground waterveins for wells. We use dowsing in our Feng Shui practice to detect energetic structures carrying geopathic stress (areas which increase decay and often can be found in close correlation with longterm illness). Dowsing can not only be used to detect earth and water patterns but also for tapping into our intuitive capabilities. The right part of our brain representing the intuitive aspect works as a parallel processor and is incredibly fast. The left brain, the rational mind, acts more as a serial processor, dealing with one issue at a time, slowing down the overall performance of our “bio-computer” dramatically. If we watch ourselves carefully when we make important decisions we often had a gut sense when we first considered the issue at hand. Later looking back, we recognize that we should have followed this intutition in the first place instead of listening to the arguments our rational mind chattered through our head. To simply follow our intuition would often serve us best. Dowsing allows us to tap into that subconscious aspect, and with that connects us to the innate knowledge and wisdom. Dowsing in most cases is practised by using different tools. Water dowsers originally used tree branches shaped like a Y (Y-rods), but also L-rods (wires bent into an L-shape), or pendulums. Over the last few decades additional versions such as tensors (bobbers) came into fashion. Tensors (“bobbers”) have a handle with a steel wire coming out about a foot with a ring or a ball on the end. Personally, I like the tensors best, because they are reliable, fast and reveal detailed information quickly. However all the tools work very well, as they don’t really do anything by themselves, but serve more like a pointer to amplifier of the dowser’s own sensitivity. It works by translating a micro-muscle response in the hand into an amplified swing of a tensor. If we therefore consider dowsing as a method to help us decide what’s best for us, for our body, sometimes even for our wallet (by not buying stuff we don’t really need), then we should probably bring a dowsing instrument along with us all day; to the gorcery store to see which foods are healthier for us; to choose which brand of vitamin C is most beneficial for us, even to a bookstore to find out if a book is worth buying. At this point I’d also like to mention Applied Kinesiology as another method to determine the body’s true response. When Dr. George Goodheart wrote his book “Your Body Doesn’t Lie” he introduced a method to access the same inner wisdom. Standard Kinesiology, however, requires a second person for the testing procedure although there are some ways to test yourself. The only problem that holds us back from using dowsing in everyday situations is that it looks weird when we pull out our dowsing instruments and they start moving about seemingly on the own. Most people wouldn’t be comfortable walking through a store with their pendulum or tensor, bobbing along with them. We also could ask a friend to join us and ask them to test us with Applied Kinesiology by testing the strength of our arm with each individual item, but again that looks pretty dramatic. Wouldn’t it be so much easier if we could apply that method in a much more discreet way? Here is the solution: BODY DOWSING. Body dowsing uses the response of our body in a simple and quick way to tell us if our body is attracted to or repelled by something. And remember: The body does not lie! • Now ask a question where the body would show a clear “Yes” response, e.g. “Show me a Yes” or “Is my name _______ (your name)?” If this is a true statement, the body will start to move. 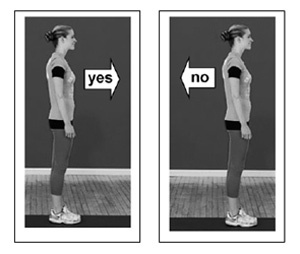 • Usually a “yes” or “confirmation” lets the upper body fall slightly forward (towards an object, if you’re testing something specific), a “no” would make you fall backward, as if being repelled by it. Of course it is much easier to find results for other people or for situations where you are not personally involved. Dowsing for yourself to answer bigger questions can be tricky. If there is any emotional entanglement and bias for a possible outcome, e.g. when asking “Should I date this person?” (you thought of that question already, didn’t you?) you can call a friend or third person, ideally someone who is neutral. Don’t tell him/her your question. Just ask them to test for some answers while you go through the different questions in your mind, one at a time. Most people’s body responds in the way described. Sometimes other results might occur: One might fall backward for a “yes” and forward for a “no”. We call this “switched”. Switching can occur when the body is overloaded and extremely stressed or exhausted. Massaging your Kidney-27 points below both your collar bones can reverse that, best combined with some deep breaths and slight tapping on head and heart as taught inBODYTALK (please see NurtureNewYork.com). Please remember that the more specific the question, the clearer the answer. And if you just can’t seem to get an answer for a particular question, just leave it and try again later. Because that non-answer is indeed the answer, that it is unclear at this time. After some practice I want you to do all your shopping this year by applying Body Dowsing. You will save money and get really nice stuff. If you try to find meaningful presents, ask your body, “Would Aunt Vicky enjoy this bracelet” or “Would this book be beneficial for my friend Jane?” Simply choose from several ideas you have for them by asking your body. When people stop at our booth at expos I tell them to test our own Feng Shui products to see if they would work well for them This way I leave the decision to the customer. Good products sell themselves. In the last issue we followed the lineage of dowsing through history, from the Chinese emperor Kuang Yu , the Egyptians, European miners in the middle ages up to very recent scientific studies in Germany. In this issue, we will have a look at some dowsing instruments and learn some basic exercises to begin with. Everybody is able to dowse. It just takes some practice and seems to work well if we are properly grounded. If we don’t get a dowsing response the flow of Qi in the body is blocked, most likely in the belly area which then will make it difficult to receive signals from our own unconscious. Below are some points to help ground and prepare yourself. Calm down from every day stress, meditate a bit and find your inner center. Focus on the Hara, the energetic center in the lower stomach, and imagine a good connection between your feet and the ground. Be sufficiently hydrated. Drink at least 2 glasses of water before you start. Water is the body’s main ingredient, if the body is too dry you will have difficulty picking up energy. Before you start always ask for permission to work with a space and its energy. In 95 % of the cases there is no problem at all. Once in a while it happens that there is resistance. This could be a sign of negative energy forces that do not want to be exposed. Also try to be clear and specific in your questions. If dowsing does not bring the desired responses it often is because a question was not clear. Without a clear question – no clear answer. For example, “Will it rain tomorrow?“ opens a variety of answers. Rain can be anything from a sprinkle to a thunderstorm. What are we trying to find out? If we should bring a jacket or if our basement is in danger of flooding? Where is it supposed to be raining? In your close neighborhood or in the bigger region? Finally the time frame is significant, too. All these unprecise assumptions thin out the energetic information we’re trying to catch. So you can see why it is very important to be as specific as possible. I personally do not engage in questions for future happenings. I believe there are many parallel possibilities for the future to develop into. In my work as a Feng Shui consultant, I use dowsing as a method to detect energetic patterns, the quality and quantity of Qi, and most importantly the position of Geopathic grids (= draining earth energy patterns) in order to avoid them. Dowsing instruments by themselves are not magic wands, they assist the dowser while tuning into subtle energy fields and their frequency information. 1. Y-shaped rods from tree branches, but also from wire. L-rods in various designs, easily made from coat hangers. One handed dowsing rods, called tensors or sometimes “bobbers“. Y-rods are held with two hands with the two ends pointing up and the tip turning circular up or down. A pendulum is basically a weighted object on a string that moves side to side, back and forth or in circular motions. L-rods are kept parallel in both hands and move either towards each other or away from each other. An L-rod can easily be made yourself with coathangers. Cut the wire and bend it to an L-shaped form, stick the shorter ends in some old pen shafts to allow free movement. Here we go! Tensors or bobbers are my personal favorite. They work fast, are sensitive and can be used easily for measuring quantities and determining exact fields.With a tensor, a typical „“yes“ looks like a head nodding up and down, while a “no“ moves sideways again like a disagreeing head motion. swings because of a micro movement of the hand of the dowser. This movement is so small that it is barely registered by the dowser himself. While dowsing one has to detach from the question itself and all desire for a specific outcome, a path one‘s ego sometimes will want to influence. This is the reason why dowsing for another person is usually much easier than dowsing for oneself. However, your “yes“ may not be the same as another persons. The first exercise therefore is to determine a clear “yes“ and “no“ for each of these tools. With a pendulum a “yes“ can be either a straight line towards you or a clockwise movement of the pendulum, a “no“ would be a cross line or a counter clockwise response. Whatever it is, this needs to be determined first, otherwise we do not know how to interpret any future results. In order to find out each persons individual “yes“ or “no“ response one can ask a question like: Is my name “soandso“ (whatever your name is). In my case I would ask: “Is my name Werner?“ If this is correct the movement of the instrument would signal a “yes“, while using a wrong name in this question would indicate a “no“. At the beginning one might need to repeat questions again and again to sense the answer. Once more, relax and try to leave your mind out. After a while you gain confidence in your new sense. You don’t have to formulate the whole question in detail any more, just thinking of it makes your body answer already. Another exercise would be to fill a bowl with water. Then use your favorite dowsing instrument and start asking “ Is this water here in this bowl?“ You should get a clear “yes“ reaction. After that ask a counter question: “Is this chocolate here in this bowl?“ to test your “no“. You then can practice with more water like substances like apple juice or similar drinks. Again, be careful with your phrasing: “Is this (pure) water here in the bowl? Or “Is here water in this bowl?“ (maybe mixed up with juice concentrate) might give you different results. Keep on practicing until you get clear answers. A more advanced situation would be the following setup: Open the water faucet in your kitchen sink and let the water run into the sink. Ask the question: “Are the energies above this swirling water disturbing for me?“ Fast moving water as in this example, but also in a water vein under ground creates Geopathic Stress patterns above itself. These energy fields are draining the Qi and need to be avoided. Locating lost objects. Good dowsers are successful even with run away animals and missing people. Map dowsing which is dowsing over a map in order to achieve results over distance. Search for positive earth energy grids as ley lines and sacred spaces. Most important in my own work the location of Geopathic Stress patterns as they have clear negative impact on our health. Selection of detailed aspects of alternative medical treatments and choice of supplements. 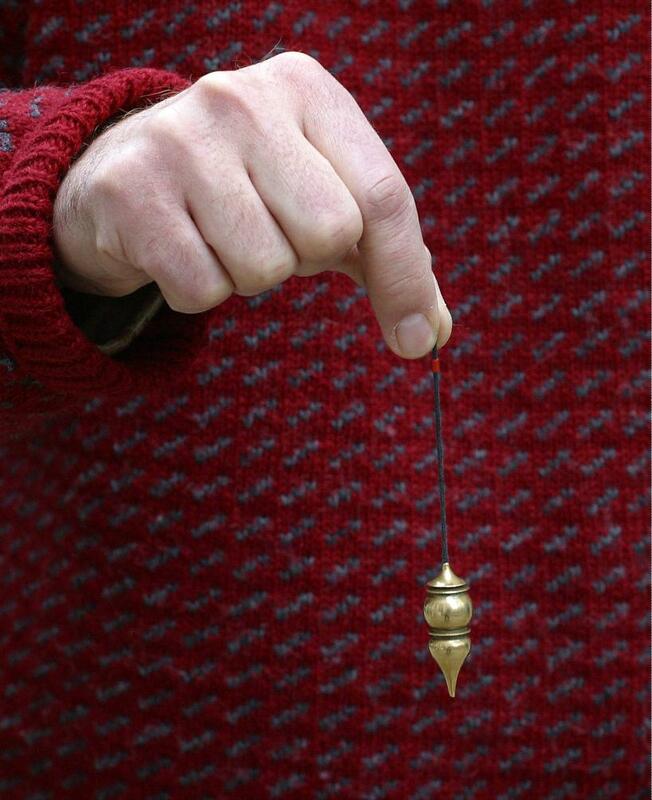 Similar to Applied Kinesiology alternative health practitioners in Europe use dowsing techniques with their work. Finally the whole world of communication with spiritual guides, devas and angels. Dowsing is a life long experience and study. If you are interested and would like to learn more about this topic visit the website of the American Society of Dowsers at www.dowsers.org. You can find literature and contacts for local meetings, as well as information about upcoming dowsing conferences. Feng Shui gained such popularity in Europe over the last few years that, for example in Austria, the government now reimburses the fee for the first 2 hours of a Feng Shui consultation. That is a major step and the result of the increasing acknowledgement of earth energy work as with GEOMANCY and DOWSING. Feng Shui consultants in Europe become more and more aware of their own roots and today combine the tradition of dowsing with the energy work of Feng Shui. Dowsing enables them to not only intuitively “guess“ the quality of the Qi/Chi in a house, but quantify it and then improve a situation step by step and rectify the results. Dealing with invisible forms of land energies and measuring its influences is nothing new. For centuries people included the knowledge of the forces of nature in their daily life, in farming or even in mining for minerals. 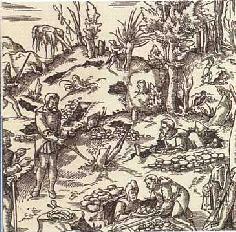 Dowsing in the common mind refers to techniques for locating water for wells, in a wider context the search for any hidden objects and is probably as old as mankind. Using a Y-shaped branch of a tree, a pendulum or an L-rod allows people to communicate with their own inner knowledge and find a way to listen to their inner voice. As a little boy I often accompanied my father when he dowsed for wells for our neighbors. As far as I remember he was always successful and found strong waterveins with a supply of good quality water. Today dowsing rods are still used commercially by some well-drillers and contractors. 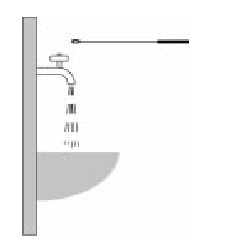 A good dowser can find pure water more than 90% of the time but also locate e.g. underground pipes which need to be spared from damage from operating heavy drilling machinery. Dowsing works through projecting an intent of what is desired and in return receiving confirmation feedback through the own body. A micro movement in the hand of the dowser is amplified by the long thread of a pendulum or the steal wire of a tensor and results in the movements of a dowsing instrument. The weight at the end moves in circles or lines and determines the reading. In the Bible Moses‘ stick with which he knocked on a rock and water sprang out as of a fresh fountain was nothing else but a dowsing rod. 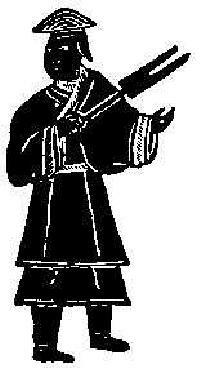 Chinese Emperor Kuang Yu about 2200 B.C. The Egyptians had sophisticated pendulums and instruments to heal, preserve and use. French dowsers did a lot of research on this behalf. In the middle ages miners in Europe used dowsing rods to find new sources of minerals. In the late 19th century English troops in India trained dowsers for at least 6 years and relied on them for finding water resources. With the beginning of the 20th century dowsing became very popular in middle Europe. German doctors who followed generations of families living in the same house, realized repeating patterns of illness: the husband of a woman who had lost her first husband and remarried, became ill with the same disease as his precessor. A mother and later her daughter die of the same kind of cancer. Researchers found clusters of specific earth energy patterns and used dowsing techniques to investigate them. 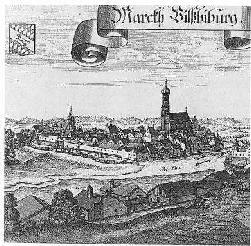 In the late1920‘s Gustav Freiherr von Pohl, a German aristrocrate, became famous with an unusual experiment: He dowsed the major earth energy patterns of an entire small town called Vilbisburg in the Black Forest district in Germany. It took him nearly a week to finish his task and map his results. The mayor then called the town’s physician and ask him to provide a list of all cancer cases of the last 15 years. When they superimposed both maps they got a 100 % correlation between houses of terminal illness and Geopathic Stress areas. Unfortunately WWII took the focus off this research for more than two decades. In the mid 50‘s the work was picked up again and is still continued with involvement of German and Austrian Universities and a growing community in the alternative health field. Dowsing is widely used today in Europe similiar to AK-testing (Applied Kinesiology – muscle testing): to determine the compatibility of homeopathoc remedies, to seek guidance with body adjusting procedures, to select helpful supplements and even to choose between brands for optimizing individual results. Dowsing also can be seen as a form of clairvoyance, the ability to see at any given moment what is happening elsewhere. Our senses are really more powerful than we think. Because our physical and psychological apparatus is designed to satisfy our desires, they realize their potential only to the extent we utilize them. A Feng Shui consultation without the evaluation and quantification of the energies in the house will not be very effective. Draining Geopathic stress zones need to be addressed and eliminated. Dowsing is a valuable method to identify sources of problems, to change them and to finally help to secure a positive environment for long term health improvements. An energy evaluation always has to start from the outside. The Qi/Chi inside the house is drastically reduced through architectural limitations. Walls and a roof on top cut off on average 70 – 80 % of the natural Qi/Chi of a place, in dense living environments the loss of Qi/Chi might be even more. If we take into consideration that sometimes the property itself seems quite void of energy to begin with, then imagine 90 % additional reduction through design and circumstances, how can we see results through simple Feng Shui cures? The arrangement of furniture, the reading of the Bagua areas or one’s best sleeping direction are often misunderstood as major Feng Shui treatments. In my understanding they are final adaptations at the end of a process. To learn more about dowsing and to find a wide variety of books about this topic log on to the website of the American Society of Dowsers at www.dowsers.org . Next issue: Feng Shui and Dowsing, part 2 : dowsing instruments and exercises to get started with.